The discipline of economics has a high level of intellectual status, even hegemony, in today’s social sciences — especially in universities in the United States. It also has a very specific set of defining models and theories that distinguish between “good” and “bad” economics. This situation suggests two topics for research: how did political economy and its successors ascend to this position of prestige in the social sciences? And how did this particular mix of techniques, problems, mathematical methods, and exemplar theoretical papers come to define the mainstream discipline? How did this governing disciplinary matrix develop and win the field? Fourcade approaches this subject as a sociologist; so she wants to understand the institutional and structural factors that led to the shaping and stabilization of this field of knowledge. A key question in this article (and in Economists and Societies) is how the differences that exist between the disciplines of economics in France, Germany, Great Britain, and the US came to be. The core of the answer that she gives rests on her analysis of the relationships that existed between practitioners and the state: “A comparison of the four cases under investigation suggests that the entrenchment of the economics profession was profoundly shaped by the relationship of its practitioners to the larger political institutions and culture of their country” (432). 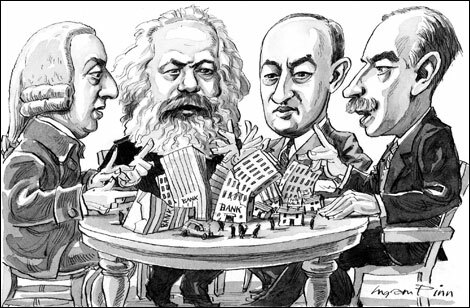 So differences between economics in, say, France and the United States, are to be traced back to the different ways in which academic practitioners of economic analysis and policy recommendations were situated with regard to the institutions of the state. It is possible to treat the history of ideas internally (“systems of ideas are driven by rational discussion of their implications”) and externally (“systems of ideas are driven by the social needs and institutional arrangements of a certain time”). The best sociology of knowledge avoids this dichotomy, allowing for both the idea that a field of thought advances in part through the scientific and conceptual debates that occur within it and the idea that historically specific structures and institutions have important effects on the shape and direction of the development of a field. Fourcade avoids the dichotomy by treating seriously the economic reasoning that took place at a time and place, while also searching out the institutional and structural factors that favored this approach or that in a particular national setting. This is sociology of knowledge done at a high level of resolution. Fourcade wants to identify the mechanisms through which “societal institutions” influence the production of knowledge in the four country contexts that she studies (Germany, Great Britain, France, and the US). She does not suggest that economics lacks scientific content or that economic debates do not have a rational structure of argument. But she does argue that the configuration of the field itself was not the product of rational scientific advance and discovery, but instead was shaped by the institutions of the university and the exigencies of the societies within which it developed. So why was Bourdieu not considered in the 2001 article? This shift in orientation may be simply a feature of the author’s own intellectual development. But it may also be diagnostic of the rise of Bourdieu’s influence on the sociology of knowledge in the 90’s and 00’s. It would be interesting to see a graph of the frequency of references to the book since 1984.